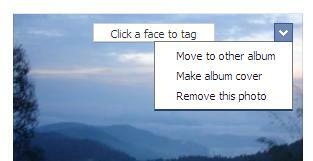 This entry was posted in PC & Tech Tips and tagged facebook new layout design, how to move photos from one album to another in faceook, how to move photos in facebook by vimalsuresh. Bookmark the permalink. Thanks, but is there a way to move multiple photos at a time ? 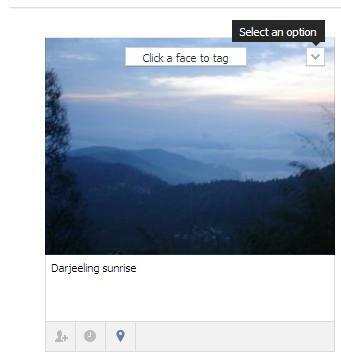 No, Facebook doesn’t provide an option to select multiple photos at a time in the new layout. but i did this type of multiple uploading at the same time..instead of selectng a single foto, just click ctrl +A then click open automatically all ur fotos will be uploaded at the same time… cheers..
Hey, that was really helpful and worked for most of my pics… But not all of them… when I click on the down arrow only 2 options come up ‘make album cover’ and ‘remove this photo’ it was the 3 most recent photos added to that paticular album So I added another, no luck.. Any sugestions? I just did a quick random check in my photo albums, and all the photos had the option to move it to another album. So technically, it should work for you too in all the photos and albums except those from your profile and cover photo albums which you cannot edit. What you can check now is to try to add one more photo to that album and see if that also has the same problem. Also, check whether there is any security permissions set on those specific photos which restricts access to only a selected users. Actually, many photos in the Instagram album do not have the option to move to another album. I guess you have to delete it and re-upload it, super annoying. I am having the same problem…the ones I’m unable to move are in my “Mobile Uploads” folder. Some I can move, others I can’t 😦 Frustrating and annoying!!! Hello, check the update on Mobile Uploads at the top of the post. Hope this helps! Your suggestion only works if you uploaded the photos one at a time. If you did ANY multi-uploads, then you can’t move the photos. REALLY a pain!!! Same here. Only some photos give me the option to “move to another album” but other photos in my “Mobile Uploads” only give me two options ” make album cover and delete. Very annoying! Im having that same issue now of some pictures having three options and others having two. Did you ever figure out a way around it? Reopening the album, even signing out and signing back in hasnt seemed to help. any ideas? Same issue here – no instagram involved – i can’ t find the pattern of why some pics in the same album will give me nly 2 option vs 3 – they are all taken and ploaded from my cell phone …. But only 5 or 6 out of 20 wont give me the “move to another album” option ….. Anybidy figured it ou yet ???? Well, I haven’t tried Instagram yet in my phone, so have no direct info on whether we can move the photos around. However, the below link should help you. It says you have to first upload the photos to the default Instagram album, and then move them around to other albums using the same procedure as in my post. Hope this helps! I used to be able to move photos to other albums from instagram album but it seems like they changed it recently. now it only gives you the two options to make the album cover or remove this photo, which will delete the photo all together… wth facebook? haha… any solutions, let meknow! I had my photo album arranged in alphabetical order. Now ever time I upload a photo in an album it makes it 1st in line. I understand “timeline” however I don’t organize my photos in that manner. How can I move the entire album? You want to move around an entire album, or any set of photos within an album up/down the order? It can be done, by just dragging the photo around in edit album mode. it should work fine with the same process, but a new album with atleast one uploaded photo must created before moving the pics from any other album to it. A photo can be moved only to an existing album. The album I am trying to move the photo too doesn’t appear in the “move to album” drop down menu, but it exists and has photos in it. FB lists all of my other albums but not the one I want to move it to. Help? I need to move my pics from one album to Wall Photos album !!! I moved my pics from Wall photos to another album, but not when I want to move them back it is not possible !!! Please let me know if I can ever these pics back to the Wall photos album??? Hi Atul, Wall photos is an entirely different category of photos, since this album gets created automatically once you post/share a photo to your wall which basically means all those photos that are in the album means they already got posted directly to your wall. Now, moving a photo from another album to the Wall photos works against that rule of getting posted in the Wall, since the photo doesn’t make it appear on your wall. The only way out as of now is to re-upload the photo directly to the wall. Hope this helps! This does not work for the mobile upload album. Hi Erin, check the update on Mobile Uploads at the top of the post. Hope this helps! It doesn’t help unfortunately, in mobile uploads you don’t have the drop down option of moving to another album. I have searched the web and haven’t been able to find an answer – very frustrating as I want to rearrange all my 2012 mobile upload photos to start the new year afresh! Same problem for me. This does not work in Mobile Uploads album. The only options it presents are ‘Make this album cover’ and ‘Remove this photo’. This is a pig, because the Mobile Uploads album is really the only one from which I want to move stuff! Hi Tracy, check the update on Mobile Uploads at the top of the post. Hope this helps! Confirming – doesn’t work for mobile uploads. Which is super annoying, because it’s the one album I want to be able to move things out of. Hi KA, check the update on Mobile Uploads at the top of the post. Hope this helps! If the photos are part of a multi-upload, it won’t work. You have to upload them one at a time before you can move photos. it still doesnt work even the way you say to do it up top. It doesn’t work for photos that are part of MULTIPLE UPLOADS. Meaning if you uploaded a bunch at a time, those photos cannot be moved. If you uploaded them one at a time, it would work. Tested this minutes before posting. You would figure this being the most used website in basically the history of the internet, the code would be a bit more logical and consistent… Really don’t want to re-upload all 30 pictures individually just to put them in their own album. I want to move some pictures from my timeline to another album. I have been succesfull with moving some of them (using the method you described), but there are two where I don’t see the “move to another album” option. Only the other two (make cover photo or delete). What’s going wrong? Any ideas? Facebook help says “All of your photos can be moved except for photos uploaded in a multi-photo upload or the album cover photo.” So if you upload photos more than one at a time, then you can’t move it out of the album you put it in. The only way I can see to put it in another album is to re-upload it directly into the album or do a single download then move it. Hope this helps. I uploaded some photos in an existing album what the status message in my wall just says “X pics were added to X album”. The question here is how do you get a group of photos to show up in a single post? Were you able to figure? It happened with me too. 👿 I lost all my comments and likes except couple likes which is weird. I’m been doing what you said on how to move photos for quite sometime now and it’s been working real well. However, today, I move any album from my Timeline to another album but didn’t pay attention and moved it to the album. Now on the other album, I don’t get the option to Move to Other Album. All I get are the two remaining options of making the picture the album cover or delete the picture. Any suggestions? The other albums I checked (3 or 4 out of many more) still allow me move them. So far, this is the only album giving me trouble right now. Any suggestions? I lost all my likes and comments after moving a picture from mobile upload to my new album which I created today. I actually moved 3 pictures one by one; weird thing I noticed that I see all likes and comments for a picture which I uploaded yesterday via mobile upload but other two pictures I see only couple likes instead of all likes and comments which were received for those two pics.and also it removed the post from my timeline too since it was posted end of last month and one in mid feb. I am really upset about it; please let me know if there is a way to retrieve all the info back. Thanks!! I’ve done it. But the photo disappeared from my Facebook Timeline. How do I get the photo back on my timeline?